[Facebook wall post] On Friday, I received the Logitech Mini Boombox for review. When I took out, I was like: huh, so small. After I paired to my phone, I played a track from Adele. It filled the entire office. Heads turned, people gathered and looked at this wonder. One colleague even committed to buy it within a minute of sampling. This is the strongest testimony one can get for a product trial. Imagine this: a battery-powered mini speaker shorter than the length of an iPhone 4 or Samsung Galaxy S2, offers up to 10 hours usage, bluetooth connectivity and direct cable connection, doubles as a speakerphone with built-in mic, touchscreen controls for skipping tracks and adjusting volume. My colleague actually intended to get this Boombox and be used as a car speakerphone. Asked why not get a dedicated car speakerphone, he replied curtly: “This is portable and multi-functional.” He also suggested that this Boombox could also be used for teleconference. The Logitech Mini Boombox is powerful enough to fill the room, doing what it is meant to do. Not only will the audio make head turns, it will make people wonder how this compact device can achieve so much. The ability for me to place this thing anywhere, anyhow, without worries of wires, is game-changing. Instead of listening audio through my mobile device speaker, I can pipe through the Mini Boombox, which is as portable as my mobile device. Exciting. As I compared the audio quality between bluetooth connection and direct line-in, I found that the bluetooth audio balancing sounds warmer and better bass production while the direct line-in gives a clearer sound with less bass. I actually prefer the bluetooth audio. The Mini Boombox can pump out most music genres rather well, but it doesn’t seem to handle certain frequency resonance well, like acoustic piano recording. When these tracks are played, the Boombox rattles. Do take note if you intend to get this to play your favourite classical piano tracks. One should also not expect the Mini Boombox to handle demanding loud music. 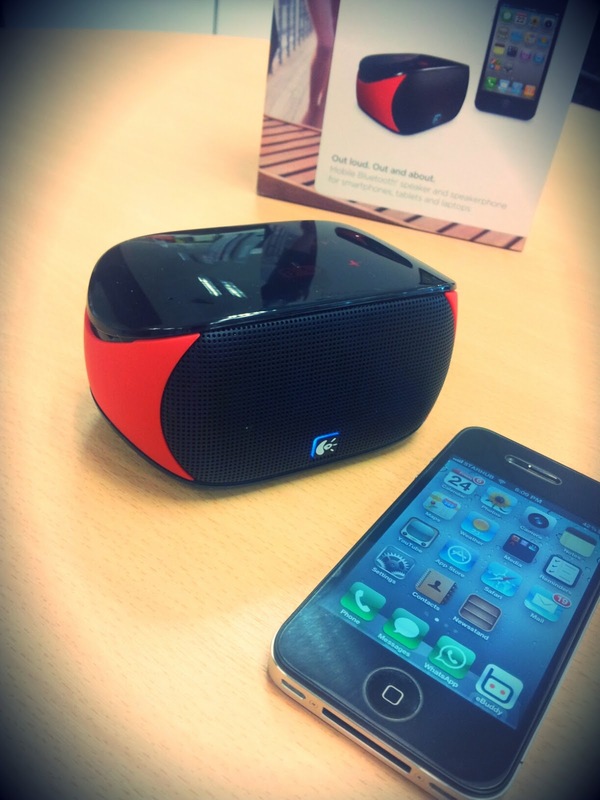 The Logitech Mini Boombox works really well as a portable wire-free speaker and handsfree speakerphone. Sound quality is surprisingly good for its size and will satisfy most consumer needs. Retails at S$109. Pingback: Logitech X300 Wireless Stereo Speaker Review – Music.Photo.Life.